Is it cheesy to admit I get a little misty-eyed at the Pokémon GO reveal trailer? I can't help it. It makes me feel warm. Sure, the video highly exaggerates the Pokémon GO experience; you're not going to find Pikachu scurrying in tall grass, or Arboks slithering across city streets. You're definitely not going to see Mewtwo anywhere near New York's Times Square, since Legendary Pokémon have yet to appear in the game. But I feel like the video doesn't exaggerate the sense of fellowship that enveloped us all when Pokémon GO took over the world during the summer of 2016. Despite political cartoonists' attempts to depict players as drooling zombies, Pokémon GO encouraged us to get together, play together, and have fun together. 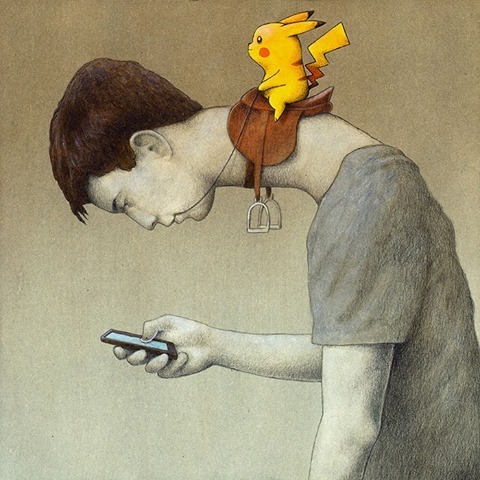 Maybe I'd take these criticisms more seriously if the cartoonists demonstrated they know at least one Pokémon besides Pikachu (cartoon by Pawel Kuczynski). Pokémon GO's history mirrors the history of the core Pokémon franchise. The initial fervor died down once reporters stopped finding value in stories about shop owners getting irritated at the deluge of kids hanging around their establishments, but many players remained steadfast after the Great Shedding. Pokémon GO is still a top-grossing app, and Niantic is still slowly molding it into something more akin to what we saw in that breathtaking debut trailer. Pokémon GO's latest update is its biggest one since the game received the Johto PokéDex: Not only are multiplayer raid battles now a thing, but Pokémon Gyms have been overhauled into something much warmer and more personable. Now team members can work together to keep up the morale of the Pokémon defending Gyms, lower-level players actually have a chance of putting a dent in high-level trainers, and defending Pokémon all cluster together and look like an actual team. Overall, the new Pokémon GO gyms are communal roosts worth protecting instead of ivory towers ruled over by the same six 3000+ CP Dragonites. That's another thing: Duplicate Pokémon are no longer allowed in Gyms. Before the update, my neighborhood was lorded by an endless parade of Dragonites, Snorlaxes, and the occasional Gyrados. It wasn't much fun to check on Gyms, because the scene rarely changed. Now I see Pikachus, various Eevee evolutions (not just Vaporeon), Ursarings, and Golems in addition to the usual Dragonites. I even saw a medium-level Mr Mime that wouldn't last six seconds against a high-levelled player under the old ruleset. Good on Niantic for making Pokémon GO a little more colorful, a little more interesting, and a little more accessible for players who are still under the level 40 cap. Will these tweaks be enough to bring the phenomenon roaring back? There's certain to be an influx of new and returning players now that the warm weather's here again, but we'll probably never see a repeat of Summer '16's frenzy. That's fine; I'm OK with just having a few dedicated Poké-Pals who will feed my beloved Arcanine when he's worn down from defending our home Gym.